A beach destination with a Smalltown, U.S.A. feel, Chesterton gives visitors easy access to the pristine beaches of the Indiana Dunes area, located at the southern tip of Lake Michigan. Chesterton has a well-known artists' community, and the idyllic, walkable downtown area is home to many restaurants and eclectic shops. Plan to sample both Indiana Dunes State Park as well as West Beach, which is part of the Indiana Dunes National Lakeshore area and about 15 minutes away. 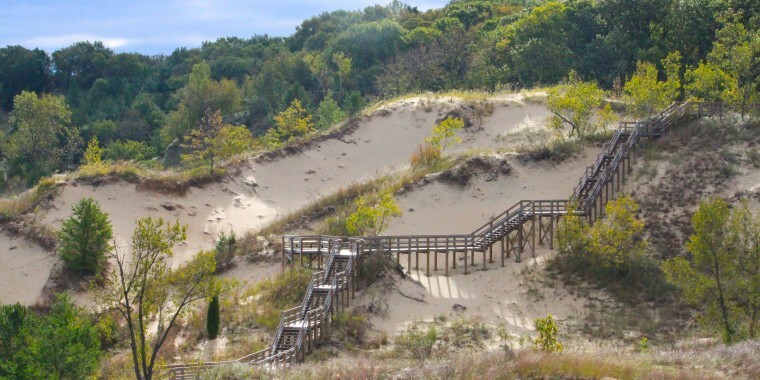 At the state park, the nature center hosts family-friendly activities like animal talks, and it's also the starting point for hiking up the park's three tallest dunes, which are about 200 feet above the shoreline. West Beach has fewer facilities and a longer walk from the parking lot, but the wilder, ungroomed national-park vibe makes it worth it. Spend an afternoon exploring the trails of the inland Coffee Creek Watershed Preserve, where you'll trade the beach for an intriguing woodland landscape with prairie, creek and wetlands. Vendors at the Saturday European Market in Chesterton (May to October) sell produce and flowers along with bread, cheese, meat, spices, rare books, clothing and accessories. Families seeking spacious, private digs should book the top-floor Beverly Shores suite at Duneswalk Inn at the Furness. To reduce bedtime stress there are plenty of sleeping options: Queen bed, queen-size pullout couch and twin bunk beds. A kitchen, fireplace and dining area make you feel like you've got your own vacation bungalow in Chesterton. Suites at the Affordable Suites of America in nearby Portage are basic, clean and spacious, and all have completely separate bedrooms and sitting areas. With nightly rates that start below $90, the hotel, part of a small Southern chain, lives up to its name. Bartlett's Gourmet Grill & Tavern is a logical stop after a day playing on the beach at nearby Indiana Dunes State Park; just look for the roadside sign of the deer guzzling a beer. The restaurant recently launched some new small-plate dishes like shrimp and crab beignets and risotto balls with gorgonzola and smoked tomato. Longtime best-sellers include baby back ribs, fish and chips, ribs and vegetable flatbread. One of the only venues of its kind in Indiana, the 49er Drive-In Theatre, in Valparaiso, shows new releases and serves fast-food fare like burgers, hot dogs and pulled pork.